In a country known for its high prescription drug costs, Americans want some kind of reprieve. That’s where GoodRx comes into play. 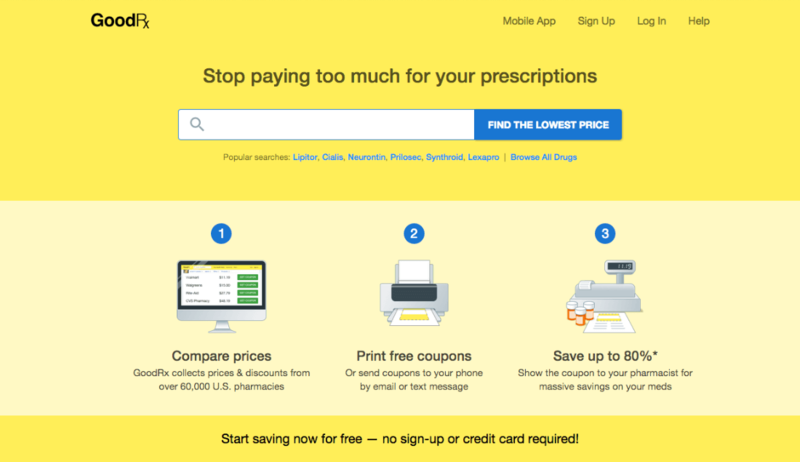 The company aims to help Americans pay the lowest possible prices for prescription drugs. It’s done through proprietary market intelligence technology that evaluates current prices at more than 70,000 U.S. pharmacies. Users can shop and access GoodRx-exclusive discounts online and through phone apps, saving up to 80 percent on necessary medications. Doug Hirsch, co-founder and CEO of GoodRx, talked with RewardExpert about an issue that is plaguing millions. After working for Yahoo and Facebook, Hirsch looked at his next venture. In 2010, after receiving a prescription from a doctor, he went to a local pharmacy to gauge the price. After being told it would cost more than $400 even with insurance, he went to another pharmacy and found it $100 cheaper. Hirsch and his two companions started the company, saving consumers more than $3 billion in prescription costs since its inception. Hirsch said it shouldn’t matter whether Americans have insurance or not. Instead, prescription costs in general should be affordable. The company doesn’t invade someone’s personal privacy, as it collects no personal information. They focus on letting the consumers make the best possible decisions for themselves, based on millions of prices that coincide with areas like insurance co-pays, Medicare and different drug manufacturers. Hirsch said U.S. pharmacies generally provide high-quality care, though that is sometimes overshadowed by the cost associated with said care. “Because of the unique way the U.S. healthcare system works, consumers pay wildly different prices for the same prescription,” he said. “My ultimate advice to patients is do your homework. Whether or not you have insurance, you can save hundreds or thousands of dollars a year if you just do a little bit of research. “Prescriptions don’t work when you can’t afford them,” he added. “Now is a particularly volatile time for healthcare in America, and we’re working hard to help the American consumer,” Hirsch said. In an era complete with rising costs of both prescriptions and general care, coupled with political frailty, GoodRx is working with doctors and hospitals to incorporate prescription prices at the point of care. It’s hoped that such methods will help improve medication adherence. The company recently launched a brand drug discount program with Express Scripts, which slashes the price of about 50 of America’s most commonly prescribed drug brands — a list that will be expanded in the future. Also, bringing down costs beyond the standard 80 percent is on the company’s agenda. It is slated to launch soon.